A Participant in the Divine Nature Of Christ. Who? Me? As much as I love scripture – studying it and teaching it – I have become keenly aware that the Holy Spirit did not stop working among us when the last stroke of the pen completed what we know now as the New Testament. The acts of the Holy Spirit continued and they were just as powerful, relevant, and active in the early church. In fact, the acts of the Holy Spirit continue even today! The Appian Way, southeast of Rome. When my husband and I arrived in Rome after a 9-hour flight from Atlanta, we had planned to sleep for a couple of hours before venturing into the Eternal City. Sadly, we were to find that our hotel room wasn’t ready for us. Oh well – we washed the cobwebs from our eyes in the hotel’s public bathroom, entrusted the bellman with our luggage, donned our hiking shoes, hopped on a bus, and headed about an hour southeast of Rome to an ancient road known as the Appian Way (or Via Appia Antica, if you are Italian). It was an awesome day – cool and dry – puffy clouds in the sky – a perfect day to hike the Appian Way back to Rome. 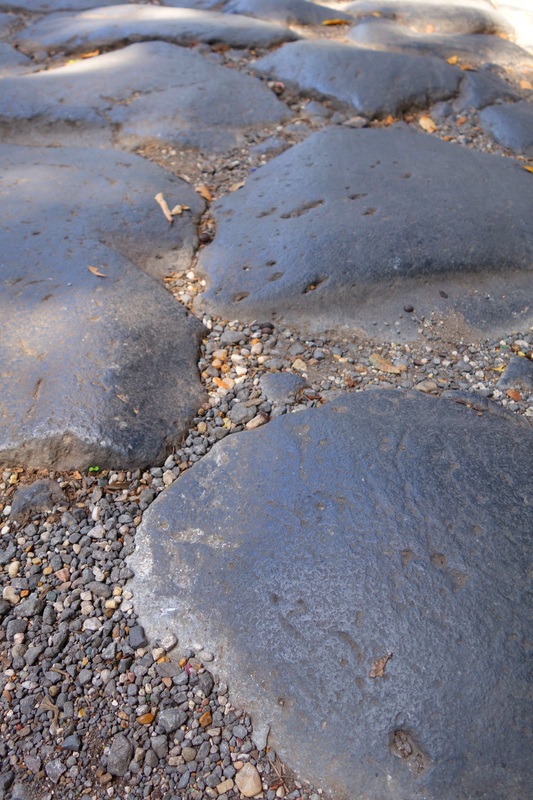 The original paving stones of the Appian Way. As we hiked on the original stones that paved the ancient road, we stopped to see all kinds of things . . . ancient mausoleums and circuses. We toured catacombs – the burial ground of thousands of first century Christians. It was in the catacombs, painted above a grave, that we saw the first known depiction of Christ as the Good Shepherd. We even stopped for lunch at an amazing restaurant where we sat in their courtyard next to a fountain and feasted on pasta. But there was one place that I could not wait to see. It was located just before we reached the walls of Rome that surrounded and protected the city. There sits a tiny, insignificant church – a chapel really. It would be easy to pass by without a thought. But, for me, this church is built on holy ground and the highlight of our hiking that day. After Christ’s death in Jerusalem, Peter became the head of the church. He traveled widely proclaiming the way of Jesus everywhere he went. He had been in Rome when persecution against Christians (who refused to worship the emperor) became increasingly frequent and violent. Warned that his life was in grave danger, he decided to flee the city following the Appian Way to safer ground. He got as far as the ground where this little church stands. Peter had given up his own life to live the life of Christ – to let Christ live through him. Because of this, Peter knew that Jesus was telling him to go back to Rome where, as a participant in the divine nature of Christ, he would be crucified. Peter would not be alone on that cross. Jesus was with him – living through him – crucified again. Peter was a participant in the divine nature of Jesus. As are all those who desire Christ. Peter obeyed. He returned, was arrested, and crucified upside down on a cross. As I sat in the little chapel, I prayed, “Domine Quo Vadis?” Lord, where are we going? How is the Spirit calling me to participate in the divine nature? Where does Christ want to take me? How can I be his hands and feet? It is an overwhelming, but joyful question – to know that wherever Christ sends me, he lives his life within me! ← Is the Episcopal Church Dead? I can’t believe I’ve discovered this just less than a month from when we depart for Italy! What good fortune. I can’t wait to see it for myself. I have a question for you. How far out did you go to begin your walk? Thank you for this wonderful article! Hi Kacee! 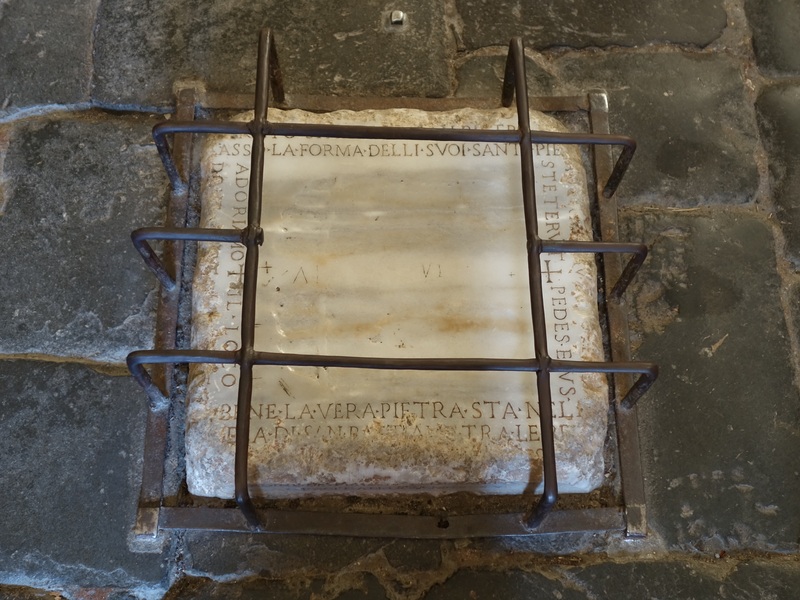 We started near the tomb of Cecilia Metella. It takes about 5 hours to walk (lots of sightseeing on the way – Catacombs, Ancient Ruins of the Circus, Sheep crossing the road, etc) to the church of Domine Quo Vadis. You can rent a bike. What I would do is buy Rick Steve’s book on Rome. He has a chapter called “Ancient Appian Way Tour” that gives details about each stop along the way – opening times, suggestions, maps, etc. We stopped for a great lunch along the way. I love Rome, but this walk was my absolute favorite part. In fact, I wish I was there right now!! Have a good trip and please let me know what you liked best, etc. Thank you very much for sharing your experience, of hiking Appian Way. A truly moving part of history, one that brings us closer to seeing who we are. I walked the road years ago, with an overwhelming sense of deep feelings for this area. Today, through your words, the experience comes alive again, with more clarity for the experience. Remarkable. Thank you for this.